Three men from Sheffield have been jailed after they were found with prohibited guns and bullets. 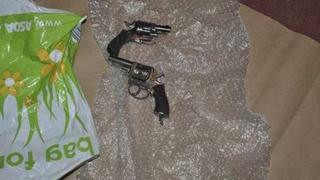 The National Crime Agency and South Yorkshire Police said all three had banned handguns and two had equipment for making the ammunition. Raymond Todd, 55, of Shirecliffe, was jailed for 15 years and James Todd, 29, of Manor, was sentenced to five years. Byron Cowling, 44, of Wincobank, was jailed for seven years for gun and bullet offences. Raymond Todd of Sicey Avenue, Shirecliffe, and Byron Cowling of Newman Court, Wincobank, were both convicted by a jury of handgun and ammunition offences following a two-week trial at Sheffield Crown Court. James Todd of Vikinglea Drive, pleaded guilty at an earlier hearing to two counts of possessing a firearm. Det Con Chris Blincow said: "The firearms and ammunition we recovered as part of this investigation have now all been destroyed. "By taking these weapons off the streets and out of circulation, it means they are not in the hands of criminals and they cannot be used in any form of criminality."